After finishing the burial and a silent prayer Jack Collins swung into the saddle, tears still streaming down his face. A horrible lump of pain sat in his throat and it seemed that each swallow added to the dead weight that collected in his stomach. He had only found her dead body an hour before and though he hadn’t taken the time to properly grieve (indeed his heart wouldn’t allow him to do so), he had made up his mind to immediately hunt the men who had done this to his beautiful wife and pay them back in lead. The cold and emptiness inside were all he could feel from her loss now and in turn made up only a small percentage of the raging emotion that threatened to boil over and consume him. The anger and unfairness of his loss was beginning to cloud his judgment and he didn’t even care. Everything had been taken from him in this one senseless act and, knowing – as he did – who had done it, he swore that he would not rest until justice was done. As he settled into the hard leather of his saddle, he quickly removed from its scabbard the Winchester ’76 and checked its action and load. There was no telling how soon he’d need the gun and he wanted it ready. He had already cleaned and loaded his two colt revolvers and was wearing them both for the first time since he had met Emily. The two, tied-down pistols had become a bond that kept him harnessed to that old life of hunting cattle rustlers and murderers and, while Emily had always been proud of his past work on the side of law and order, she also saw that life as one with inherent patches of moral gray – as if she had known how many times he had bent his conscience (if only slightly) in order to bring about justice. Therefore, to please her – or more appropriately, to completely dedicate his life to her – he had only been too happy to set aside any link, visible or invisible, to that life of bending right and wrong. Even though he had shared everything in his past with her – without reservation – he still wanted her to think only the best of him. This had caused him to only wear one gun at a time, when he wore a gun at all. The feel of the two guns strapped tightly to his thighs now felt simultaneously familiar and foreign … but most of all, it contributed to his emptiness. His past is what had also caused him to seek out a place that they could call their own, far from the memory of his work in Texas. He had wanted a place where they could live in peace and not be reminded of his days as the famed gunfighter of the harsh, dusty towns of the Rio. That was what had brought them to the soaring mountains of Colorado. Furthermore, to aid his and Emily’s renewal he had always refrained from telling his new neighbors much about his old life. After all, there were few people throughout the west who were unfamiliar with the name and legend of Black Jack Collins. The legends had grown over time and had slowly obscured reality. The stories that had been told and re-told around campfires and in saloons had slowly elevated his achievements to the point of exaggeration. They told of a young gunfighter who had killed at least twenty of the fastest guns in the border towns of Texas and Mexico and that he had single-handedly captured the famed Morton rustling gang which terrorized the mountain country just east of El Paso. Jack knew that the number of gunfighters killed was actually seven – a large number without the need of embellishment – along with a few others who had been foolish enough to draw on him. He also was always ready to acknowledge the two other Rangers with whom he had worked against the Morton gang. But for some reason nobody ever listened when he corrected the tales. He wasn’t thinking about these legends though as he spurred his horse down the western trail out of his ranch yard; the legends wouldn’t help him now. He was thinking only about that rattlesnake George Butler and his gang. He knew they had finally found him and had hit him, cowards as they were, in the only place where they knew he was vulnerable: Emily. Most outlaws of the day wouldn’t have harmed a woman at all, but Butler was different. Butler had ridden with Sherman on his march into the South and some of the people that knew him afterward said that it was this which had given him a love of destruction. It was easy to believe this logic as Butler had burned at least two ranchers’ homes down in the Texas hill country. At first, he was known only as a petty cattle thief, cutting out stragglers from traveling herds and selling them to unscrupulous cattle yards who didn’t care that his deliveries bore twenty different brands. But it wasn’t long before he became more brazen in his thievery and began murdering entire groups of cattle drivers. His gang had numbered around twenty-five men at its height and he had stolen enough cattle to make himself a very rich man. However, as is the case with such men, his appetite for drink, gambling and women saw him frivolously spend as much as he stole, continually whetting his appetite for more. It was between one of his sorties of murder and theft that he and Collins had had their first (and only) face to face run-in. Butler, a big, meaty man well over six feet tall and weighing a solid 220 pounds, was sitting at a poker table in Laredo late one night, his pride swollen dangerously by whiskey and winning hands, when a tall, thin young man with dust-brown hair sauntered in. This new man carried himself with such assurance that the naturally wary Butler kept watching him as he crossed the wooden floor to the bar. Butler’s quick eyes appraised the young Jack Collins for what he was: the most dangerous man in the room. Collins had looked to everyone else in the saloon as a man who wanted to be left alone and simply needed a drink; his eyes seemed glued to the floor as he took a seat at the bar with his whiskey. But Butler had seen his keen evaluation of the room when he had first entered and the furtive, controlled glances in all directions as he crossed to his seat. He had noted the way the younger man’s eyes took in the potential threats and had seemed to loiter a split second longer on him than on the rest of the room. Furthermore, he had seen a glint of familiarity and expectation in that moment – as if time had slowed and the rest of the crowd had dissipated leaving the two of them evaluating only each other. Over the next hour Butler’s winning hands began to desert him as he felt the occasional flit of Collins’ eyes on him from across the room. What does that boy think he’s lookin’ at?! George Butler’s mind screamed as he folded another pair of sixes. He turned and gruffly ordered another drink from the bartender while using the opportunity to glance at the source of his angst. Collins sat calmly where he had for the last hour, his left hand gripping his whiskey softly and his right holding a book open in front of him. Collins’ dark eyes surreptitiously glanced above the top of the book and the two men made eye contact again. Neither one broke the gaze for several seconds until the bartender walked in between them to deliver Butler’s drink. The tension created by the two men became palpable to the tuned senses of the surrounding cattlemen, farmers and merchants, with their conversation almost imperceptibly lowering to a dull growl as a consequence. Still, even though the discomfort was there for each man present to feel, the only two individuals in the saloon who knew the source were Butler and Collins. The rest of the men in the room suddenly became fully aware of the tension they had been feeling but not acknowledging, as well as the source. Every eye in the room turned to the duo, noting Butler’s poison gaze and threatening lean in contrast to the relaxed brown-haired young man across from him. The new-found attention of the room seemed to go unnoticed by the two men as they broke eye-lock only to blink. “Don’t do me any favors,” came the smirking, confident reply from the thin, young man as the tension in the room grew thicker. George Butler’s smirk gave way briefly to shocked incredulity, before realization cut through inebriation and he reached for his gun. Collins’ own face slowly gave way to a grin as if he liked the idea. “Okay George, have it your way. Just take that gun out of your holster very slowly … with two fingers and hand it to the good man behind the counter.” The bartender walked cautiously over to collect the weapon. “Any other weapons, George?” Collins asked with a chuckle. Collins quietly handed his guns to the bartender too and turned around just in time to catch Butler’s left fist flush in the jaw. He immediately tasted blood and felt the floor rush up to meet him as the entire room began spinning. Wanting to press his advantage from the off, Butler was lunging at him as his senses began to return. Jack rolled away swiftly to his right and bounced to his feet using the bar as a momentary screen. Chairs around the room scraped against the wooden floor as the thirty-odd patrons scrambled to both get out of the way and to get a better view. As Butler advanced around the corner of the bar, Jack stepped to his left to meet him, jabbing a firm right to the bigger man’s midsection and following it up with a left haymaker aimed for Butler’s chin. Butler absorbed the jab to his stomach, blocked the follow-up with his shoulder and then stepped closer to bear-hug the smaller man, flinging him over a table in a rage. Collins jumped back to his feet as Butler raced in, his right fist clenched and flying ahead of him. Collins dodged to his own right, with Butler’s punch only glancing off of his shoulder, and then let loose two quick shots of his own – a left which landed below George’s rib cage and a right that broke his nose. Butler shook off the two hits and released a mighty uppercut that caught Collins on the chin and sent him reeling. As Jack stepped back, Butler reached into his boot and pulled out a knife, whipping it within an inch of Jack’s throat. Collins found himself back at the bar and reached over to grab the book he had been reading. As Butler brought the knife back at Jack’s face in the opposite direction, Collins closed the book around the knife and twisted it out of Butler’s grip. Book and knife clattered to the floor as Jack immediately let go of both. The action stopped Butler in his tracks and, in a split second, Collins was able to bring both of his hands down on the back of Butlers head and his knee up into his face. George Butler staggered back one pace and only looked up in time to see Collins right fist flash against the side of his head, bringing darkness with the impact. The next morning Butler had woken in a jail cell with five other members of his gang. A week later, Collins’ and a friend, James Waylon’s, testimony in court had swayed judge and jury to hang them for the murder of seven Rolling R hands who had been killed on a cattle drive to Ft. Worth. Collins and Waylon had been traveling nearby and, after hearing gunshots, only arrived in time to see who had been killed and who had done the killing. Collins and Waylon had followed the gang into Ft. Worth but hadn’t been able to convince the Sheriff to arrest the men. With his sense of justice shaken, Collins had hired himself out to the State of Texas and become a Ranger as a result; tracking the gang to Laredo and the capture which would begin his epic rise to unsought fame. Butler and the other five members of his gang sentenced to hang were broken out of jail two nights before the gallows had been built. All six of them had disappeared after that. Collins then spent five months searching for them in the hills and deserts of Mexico, but was never able to catch any of them. The only results of his tireless tracking were glimpses of distant campfires, horse tracks left in dry dust, bent and broken branches in gullies and rumors of an increasingly anxious and erratic group of gringo desperados always a day or more ahead of him. When Collins finally received word from the Rangers to return to Texas, he was under no illusions about his situation. Butler and his men weren’t likely to stay in Mexico forever. They would return to Texas and no doubt hunt Collins down and pay him back for his determination. Jack Collins became an exceptionally observant man after that. It was an awareness which kept him alive, but also turned him into the preeminent outlaw hunter in Texas. The number of outlaws he had caught was exceptional, but it was the number he had killed – in stand-up, fair fights by all reports – which had captured people’s attention. Nevertheless, no matter how many fugitives he caught or how careful he was, he could never shake the thought that Butler and his men were around every corner he turned or on the other side of every door he opened. The demon-Butler in his head began to take root and his anxiety mounted with every month of no news on the man’s whereabouts. When he finally got news about Butler, it was five years later and proved the worst news he could imagine. They had tracked down and killed James Waylon in the streets of Ft. Worth, disappearing right after the deed. Collins’ anxiety and frustration finally made him ask for a leave of absence from the Rangers and he was granted it with heartfelt condolences. He probably would have lost his sanity completely had it not been for Emily. His intention when he left the Rangers was to take a month or two, see some friends, try to get some rest and then go back rejuvenated for again picking up the hunt of Butler and his comrades. But he hadn’t counted on meeting the sweet, dark-haired beauty. Collins rode into Waco planning to rest his horse, get a good night of sleep and then continue south to Austin to see an old friend. He had gone about his business nonchalantly, trying purposefully – desperately – not to add his usual urgency to what was supposed to be a calm, relaxing trip. He forced himself to walk a step slower than usual and take the long way around from the stable to the hotel. It was a fortuitous walk because, though he could slow his step, he could not slow or limit his always careful and observant eyes and he was rewarded with a glimpse of a woman with a beautiful face, framed in dark brown hair, standing behind the counter of a store. His route, already circuitous became even more roundabout, taking a reflexive detour toward the angel. Jack’s mind began to race. Why am I walking into that store? Since when do I need to meet a girl? She won’t want to give a drifter like me the time of day. As he crossed the threshold and the woman looked up and smiled at him, he suddenly had the equivalent of a mental hiccup – panic ringing through his brain as she greeted him warmly. Oh no! She’s going to ask me what I need … and I don’t need anything from here! Come up with something! Fast! His words, though wholly inadequate to express the burgeoning, inexpressible love in his heart, made her smile shyly and blush humbly – only serving to somehow improve her beauty in his eyes. It was this that began their life together … inauspiciously, yet favorably. Jack blessed that strange diversion, from an already winding route in Waco, every day after, as it proved to be the end of his days as a gunfighter (so he thought). 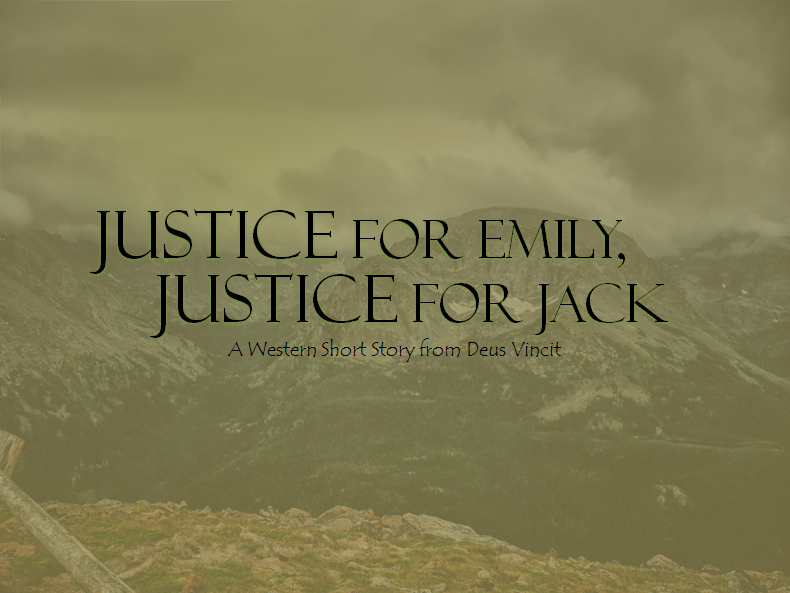 Emily’s grace began to disarm and conquer the layers of harshness and pessimism that had settled on Jack Collins’ heart. Emily proved to be even lovelier on the inside than on the outside. She always had time to help others. Indeed it seemed to be a part of her nature to even seek out people whom she could help and to meet their needs in ever more creative and caring ways. Jack, his heart full to bursting with love for his Texas flower, appreciated this active mercy – so foreign and opposite to his lawman’s worldview – so much that she transformed him completely. It wasn’t hard then to finally step away from the badge that had been his constant companion and crutch for the last five years in order to make a new life in Colorado with his wife and rescuer. She was never demanding in her careful, yet unconscious, rehabilitation of her man, but the distance in miles from Texas was viewed by both of them as a necessary ingredient to new life and healing. And so it had proved … until the unthinkable had happened and the Butler gang had tracked them down. Shaken back into the saddle –and the present – from his reminisce, the hunter-lawman turned married man turned homesteader turned back to hunter, brushed a hot, angry tear from his eye, swallowed down the gnawing guilt and pain he felt into the void inside his gut, and spurred his horse forward with renewed vigor. Justice must be done … he would make sure of it. Black Jack Collins – for he was no longer plain old “Jack Collins” anymore, he was back to his dangerous moniker and self again – followed the trail of the Butler gang toward the mountains west of the small ranch that he and Emily had called home. He climbed the narrow, switch-back trail onto a foothill covered with scrub and cactus. The familiar instincts of the hunter began taking hold again as he simultaneously scanned the ground and shrubbery for signs of Butler’s passing as well as opportunities to be waylaid by his treacherous quarry. There were five other men with Butler, Collins could see their sign on the trail. No doubt these were the same five men who were with Butler in their murder of the Rollin’ R hands and on the run in Mexico. It’s not that Butler and his men were eschewing secrecy. In several places Collins could see where one or more of them had back-tracked and attempted to cover their tracks. But Collins’ three years in Colorado had accustomed him to the look of a normal, untouched wilderness, making disturbances evident to his sharp eyes despite their efforts. Mulling the situation over, Collins was actually happy to see that they were attempting to cover their tracks. After all, unless they had already seen him and therefore didn’t want to startle him by changing their tactics, their clumsy attempts to obscure their hasty path away from his small ranch meant that they were not planning a trap … yet. Black Jack was certain they would try it at some point, but he surmised that Butler would expect a little more grieving from the new widower than Black Jack had allowed himself. It wasn’t that Butler had overestimated Black Jack’s love for Emily – on the contrary, he had likely underestimated it – but he misunderstood the way Black Jack would deal with the grief. A normal man would of course want justice done by the law and allow some time for it to be done, however a former lawmen like Collins – independent, confident and prone to impetuosity – would want justice done and carry it out himself. As soon as Butler pulled the trigger on Emily, the calm, clear-headed, patient Jack Collins, cultivated by a dark-haired Texas beauty, reverted back to the hard law man and hunter. The bright, calm man, planning a future with the loveliest girl he could imagine, had morphed back into what Collins had been before: a sad, frustrated lover of justice. The reserved, deferential small rancher and farmer had only been known because of proximity to the grace and love of his Emily and that one tether to a calm life – a tether strong as steel and soft as silk – was suddenly gone. Black Jack Collins now floundered, unanchored in a sea of grief, pain, anger and even hatred.